The Walt Disney Co. unveiled long-awaited details about its Disney+ streaming service Thursday in an elaborate presentation on the studio’s Burbank lot, announcing an aggressive strategy that undercuts rivals on price even as it bulks up on some of the world's most recognizable entertainment brands. Star Wars storm troopers greeted analysts and press as they arrived for the investor presentation. Over the course of the next three-plus hours, Disney executives touted the global appeal of the company’s iconic brands and its heritage of telling stories that resonate for generations—saying both would fuel the success of Disney+. But it was the price that signaled the entertainment monolith’s seriousness in staking its claim as a significant player in the rapidly expanding streaming world. Disney+ will cost $6.99 a month when it debuts on November 12—less than Netflix’s cheapest plan, at $8.99 a month. Disney is looking to make up for lost time. The company hopes to attract 60 million to 90 million subscribers worldwide by the end of fiscal 2024, with one third coming from within the U.S. The media giant plans to invest heavily in original content, spending about $1 billion in cash in fiscal 2020 and ramping in subsequent years, as it looks to gain subscribers. It hopes to turn a profit within five years. At launch, the Disney+ service will reach into the Disney vault and offer family-friendly films like Mary Poppins and Alice in Wonderland, popular Disney and Pixar animated fare, including 101 Dalmations and Bambi toFinding Nemo and Inside Out, and nearly every Star Wars film. Thanks to the recently completed Fox acquisition, the service also will feature more than 250 hours of National Geographic programming, including the Oscar-winning documentary Free Solo and all 30 seasons of The Simpsons. Over time, Disney+ will become the exclusive streaming home for all the films released by Walt Disney Studios, starting with this year’s theatrical releases, which include Captain Marvel, Avengers: Endgame, Toy Story 4, the live-action reboot of The Lion King and Star Wars: Episode IX. Original programming will include more than 25 series and 10 films, documentaries and specials. Among the originals showcases Thursday were a 10-episode scripted series, High School Musical: the Musical, in which a group of students count down to the opening night of their school’s stage production of the Disney Channel musical, and The Mandalorian, the first live-action Star Wars series, written and directed by Jon Favreau. 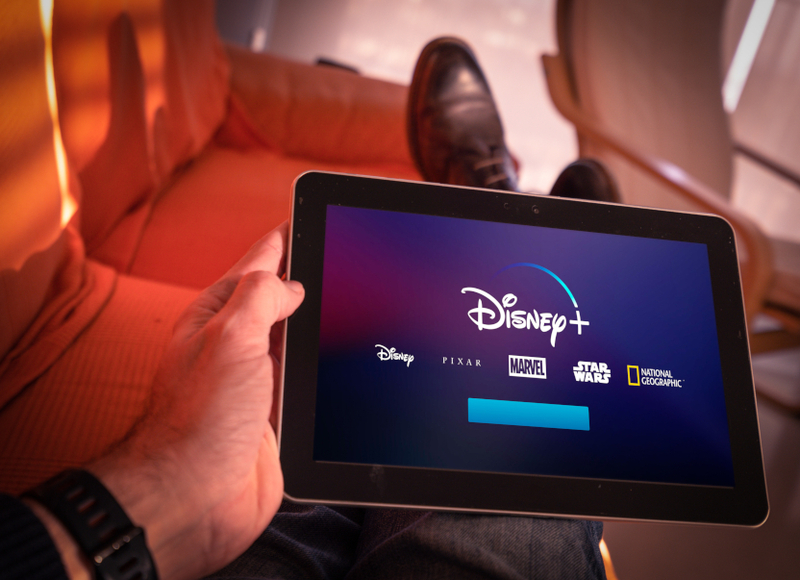 By the end of the first year, Disney+ will house more than 7,500 episodes of television shows and 500 movies. Disney plans to promote the service at events where fans already congregate, like the Star Wars Celebration in Chicago, the San Diego Comic-Con and the D23 Expo, as well as in its theme parks and on its cruise ships. Kevin Mayer, chairman of the Direct-to-Consumer and International division, said the company is evaluating another move that would accelerate adoption—bundling Disney+ with its other streaming services, the sports-focused ESPN+ and Hulu, the TV streaming service in which it holds a controlling stake.